You're the Angler. Catch the big one. Now you can make your own lures. Mix and match heads, bodies, and tails to create the perfect lure for your angling needs. Then make a mold of your unique lure shape and cast with the included Soft Bait Rubber. 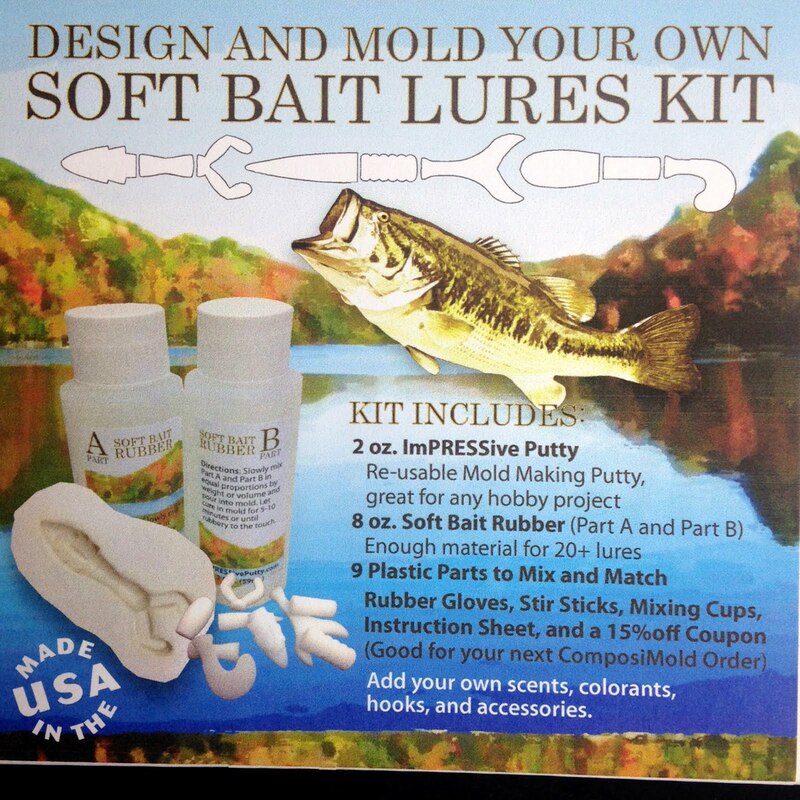 The mold Putty is re-usable, so melt your mold and make as many different shaped lures as you want. The Soft Bait Rubber has NO PVC, mixes 1:1 by weight or volume, and cures to a soft rubber in 5 minutes.To start making your own soft bait lures, you can use the shapes we provide, but when you’re ready you can expand into almost any shape. 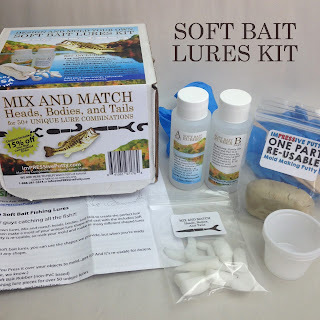 Soft Bait Fishing Lures that You make yourself. 9 interchangeable fishing lure pieces for over 50 unique lure shapes. Gloves, stir sticks, mixing cups, and instructions. Create a truly unique lure by choosing one head, body, and tail from the included shapes. You can make your lure longer by using 2 body pieces instead of 1. Use a dot of hot glue to hold each one together. Scrape away any hot glue along the seam. Heat the ImPRESSive Putty in the microwave in 15 sec. intervals until dough-like with no lumps. CAUTION HOT: Let stand for 10 minutes until temperature is comfortable to handle. Place your glued shape on a flat surface and PRESS the ImPRESSive putty onto the shape. Let Putty cool at room temperature until firm to the touch or 15 minutes in the freezer. Remove original shape by flexing the Putty away from it and pulling it out. CAST THE LURE, then Cast your lure. Thoroughly mix Part A and Part B of Soft Bait Rubber in equal portions by volume. If you choose, you can add any dyes, fillers, glitters, scents at this time. IDEA: Add crushed up pieces of Styrofoam to decrease weight of lure or add dry sand to make it more dense. Resin Colorants and Glow In The Dark Powder sold separately. Wipe any Activator off the inside of the mold with a paper towel or cloth before pouring your Soft Bait Rubber in. Pour your Soft Bait Rubber into the mold until it is flush with the top of the mold. Tap mold gently to release any air bubbles. Let the resin cure in the mold for 5-10 minutes or until rubbery to the touch. Flex the mold away from the casting to remove your one-of-a-kind soft bait fishing lure. You might want to make a couple of the same lure just in case your neighbor decides to help himself to your prize winning lure. So repeat the casting process above to create multiple lures in that configuration. Break the lure shapes apart by slicing through the cooled hot glue. Scrape the cooled hot glue off of the pieces and rearrange them into a totally different lure configuration. Re-Melt the ImPRESSive Putty mold and repeat the process of creating your mold and castings. SAFETY: ImPRESSive Putty is hot when melted and can burn. DO NOT handle straight out of the microwave. Let it stand until cool enough to handle comfortably. ImPRESSive Putty is not certified for use with edible materials. Leaking Activator from Putty can stain furniture. Store in an airtight container. Intended for ages 10 and up. Do not eat the Putty. Soft Bait Rubber: The soft casting rubber is a two part silicone casting resin with very low hardness (Shore D of 5) formulated to attract really good looking and big fish. While still in liquid form, the Soft Bait Rubber should be kept away from your skin. Use gloves. Do not eat or drink. Please do not litter. 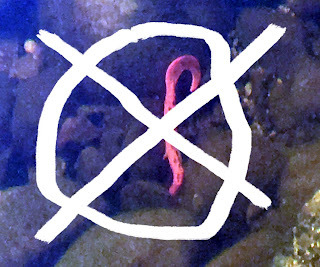 Please do not leave your rubber lures in the water or fish. The lures are not biodegradable.